Combining practicality and attractive design, Dyson vacuum cleaners offer a wide range of models for all your cleaning needs. 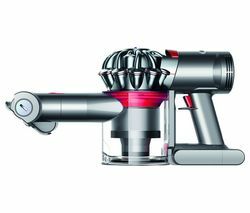 Dyson’s trademark technology makes their vacuum cleaners super-efficient, and will shave time off your housework with superior suction. Dyson have done away with vacuum bags so Dyson vacuum cleaners can be emptied easily, saving you time and money. The more traditional upright models offer regular vacuuming, as well as wand and hose attachments for getting those hard to reach spots. If you don’t want to be plugging in each time you clean then a cordless Dyson vacuum cleaner could be what you need. With the larger models holding enough charge for up to 20 minutes of cleaning you can get your vacuuming done quickly and easily before needing to recharge. For smaller tasks you can opt for a smaller cordless Dyson vacuum cleaner, with charges of 6-15 minutes. And cordless certainly doesn’t mean less suction, as the V6 Total Clean will pick up as much dirt and dust as a corded model, and has an additional cleaner head designed for hard floors. If you’re not set on a Dyson then check out our range of Hoover vacuum cleaners and Vax vacuum cleaners. Whether you’re looking for a small handheld or a full on dust-buster, our range of vacuum cleaners offer value for money and practicality for the modern home.